I'm embarrassed to realize that the Parcheesi quilt that I've been ignoring on the quilt frame has been there since July! There's nothing like a historical look at my blog to shame me into a little bit of action. Instead of quilting that puppy, I've been starting new projects, and buying them as if I'd live forever and didn't have a day job. 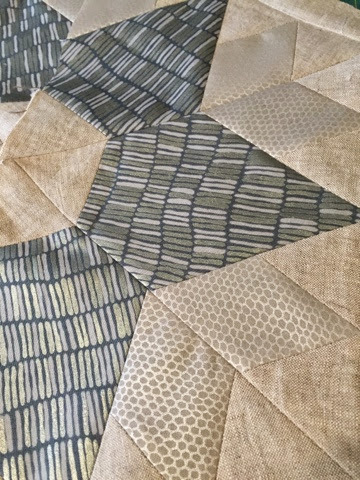 The first new quilt I started was Day Break using a Julie Herman, (Jaybird Quilts) pattern. It utilizes the "Hex n More" ruler and the "Sidekick," which I needed to put into some use since I splurged on them. I'm using linen, (Robert Kaufman's Essex yarn-dyed linen in flax,) as the background fabric. I find the tactile sensation of handling linen to be extremely satisfying; like a double dose of textile therapy. However, the way linen cuts and sews is a lot less precise than good quality quilting cotton; one has to be a little flexible about the way it goes together, with seam allowances that vary a bit. Fortunately, with the Day Break Quilt, most pieces are sewn on a bit of a bias, giving a little "give and take" on each one. 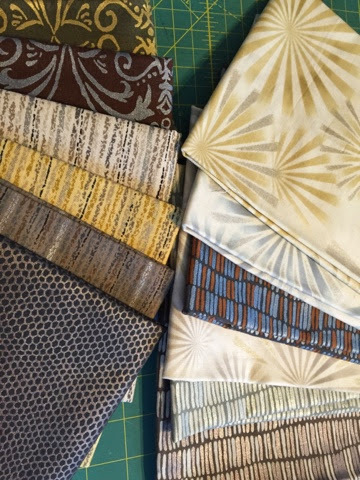 These are the fabrics I'll use for the stars in the quilt; Shimmer, from Robert Kaufman. I really enjoy the texture that the linen adds to this quilt. I'm aiming to piece for a full size quilt, but may put it together a little creatively and ultimately end up with a king size quilt. I just bought linen sheets from roughlinen.com, check it out, and I'd love to top the bed with this soothing quilt. As for other new projects, I pieced the squares for Rise and Shine by Camille Roskelley of Thimble Blossoms Quilts. I used the Mormor Jelly Roll and the Kona Eggplant for background. This is the quilt I worked on on 11/17 when I spent most of the day in my sewing room. I had to pack it up because there are some garments in my future. I also started a craftsy BOM, (2012) part of which I took to Cancun for some hand-stitching fun. English paper piecing is a quilting technique that I'd thus far avoided, but it lent itself to travel so nicely that I decided to give it a whirl. I can easily see how addictive it is. Here's the Craftsy version of it, and I'll photograph the 8 blocks I've done at some point. 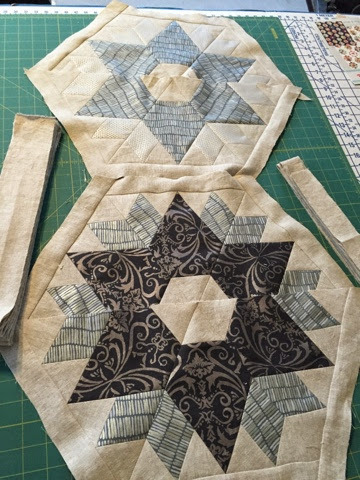 If you are interested in a "world tour" of quilting techniques, I highly recommend this free craftsy.com class by Amy Gibson. This is her version of the quilt. Mine looks less bright, I think. I also bought, but haven't started, Red Letter Day, also by Camille Roskelley, using the Miss Kate fabrics that I've since fallen in love with and resorted to some serious stash-building at both Hancocks and Etsy. 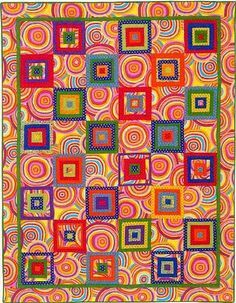 In addition, I've resurrected my interest in the Kaffe Fassett polka dot rich quilt that somehow has eluded my spreadsheet! I've got the whole thing kitted up in my cabinet, and will one day "slow piece" that puppy since it's a work that lends itself to cutting and piecing as you go. I think this one needs a snowy weekend to tuck into. OK, another confession, while I'm on a roll: I've also acquired and stashed all the fabrics and pattern for this quilt called La Fete De Noel, from French General. I saw it on craftsy, and the kits were $152, so instead of just buying the darned thing, I sourced all the fabrics and saved very little money on the acquisition, but this puppy is yet another quilt in my stash waiting to happen. So that's SEVEN new projects happening in my sewing room, none of which include actually quilting that Parcheesi quilt. I'm going to give myself a deadline of the end of the year to have that thing done and off the frame. All these new tops need to get quilted!